In financial advice, the importance of the adviser-client relationship is well documented, but the nature of those relationships is changing as consumer behavior continues to evolve. In this paper we examine the implications for the adviser-client relationship of the growth of mobile device use by advice clients. It is widely known that digital information is accessed differently depending on the device/s being used; computers, tablets or smartphones. 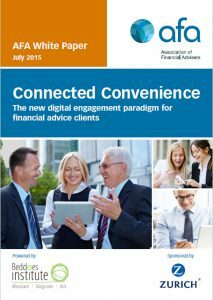 This white paper extends the “Connecting with Clients”1 research by exploring how financial advice clients use mobile devices such as tablets and smart phones to access information and the implications for how financial advice practices communicate with their clients via digital communication channels now and in the future. Because the experience created by each device and how they are used is different, advisers creating content and delivering it with functionality that is specific to smartphones and tablets will maximise penetration and engagement with their clients and new groups of consumers.